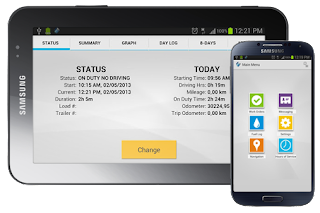 The TSO Mobile's Blog: TSO InCabin - Mobile Dispatching and Fleet Management for Android. TSO Mobile's "TSO InCabin" is the dispatchers' Android App for workforce management & The Improvement of Driver Communication. This new HOS Compliant app and addition to TSO Mobile's products and services, is the perfect and most complete solution for fleets of vehicles that are already doing GPS Fleet Tracking with TSO Mobile. That's right! TSO InCabin is available for everybody in the GooglePlay app store, but only those businesses with fleets of vehicles and users of TSO Mobile's GPS Fleet Tracking System can make use of it. In today's challenging and highly competitive industry, workforce management everywhere is looking for solutions that will help stand out from the competition and get things done more proactively. TSO Mobile's InCabin solution for Android devices delivers unique development in customer service and satisfaction, fleet performance, workforce management, operational effectiveness, and the technological advantage your business needs for its growth. TSO InCabin runs on Android devices that will be used by dispatchers and drivers, and is synchronized with the data from the GPS Fleet Tracking and Dispatching System. • Fulfill and Monitor Hours of Service (HOS). • View and Manage Work Orders. • Improve communication with drivers. TSO InCabin eliminates paperwork and helps improve workflow in a mobile dispatching environment.